February 2018: We have reached over 50% of our target for funding for OpenFOAM in 2018 through commitments from supporting organisations to purchase OpenFOAM Maintenance Plans. We need further support from organisations who are commercially dependent on OpenFOAM and who are making significant savings in proprietary licence fees. In 2016, we ran a successful campaign to raise €100k of funding for OpenFOAM in 2017. It has funded, amongst other things, improvements to OpenFOAM, e.g. a rewrite of the tracking algorithm, fixes to reports on the Issue Tracking System, packaging of OpenFOAM for popular Linux OSes and macOS, and the release of OpenFOAM v5. These activities form part of recurring costs to maintain OpenFOAM to a high standard and evolve it to changes in user expectation and environment. The costs are approximately €250k per year, including the following. €80k — “Usability” Developments, providing new code, example cases and documentation of general benefit. €60k — Code Redesign: modifying code structure to manage the integration of new developments and ensure maintainability and extensibility. €60k — Issue Resolution: managing approx. 500 reported issues per year, providing corrections to incorrect/incomplete functionality. €25k — Distribution and Testing: creating test cases, running tests, code compilation, packaging, version releases and promotion. €25k — Operations: marketing, IT/cloud infrastructure, e.g. running 4 websites, licence compliance and enforcement, finance and administration, general enquiries. For 2018, we have introduced maintenance plans to fund the maintenance of OpenFOAM. 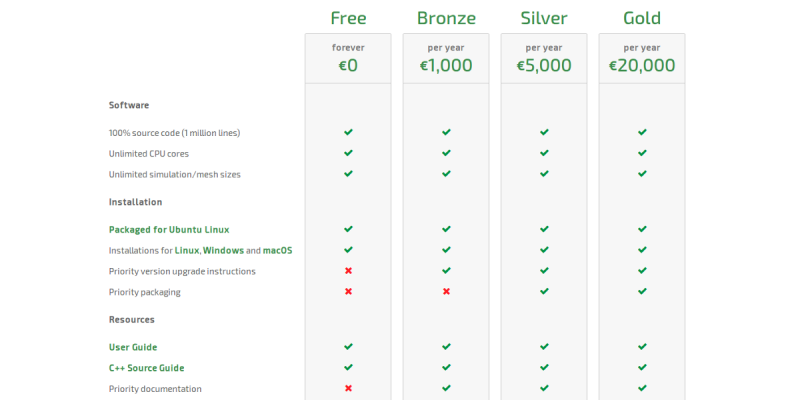 There are 3 plans: Bronze at €1k per year; Silver at €5k; and Gold at €20k. Priority is given to maintenance requests from users backed by a maintenance plan. Bronze gives priority over published information, e.g. requests for additional documentation, instructions, recommendations, etc. Silver gives additional priority over quality assurance, e.g. fixes on the Issue Tracking System, inclusion of test cases for critical functionality and packaging for installation. Gold gives additional priority over requests for usability improvements and code redesign to support new functionality. OpenFOAM can always be downloaded for free. Users can choose not to contribute to it, but then equally they have no right to expect or demand anything from those who do contribute to it. However, businesses need greater levels of assurance in software that is used for research and development, product design, safety or other critical applications. With a maintenance plan, a business reduces the risk of poor software maintenance and is given priority over issues that affect it the most.